"Dan Patrick threatens to use "nuclear option" to skirt Senate tradition and bring property tax bill to the floor" was first published by The Texas Tribune, a nonprofit, nonpartisan media organization that informs Texans — and engages with them — about public policy, politics, government and statewide issues. Faced with a stalemate on his priority property tax proposal, Lt. Gov. 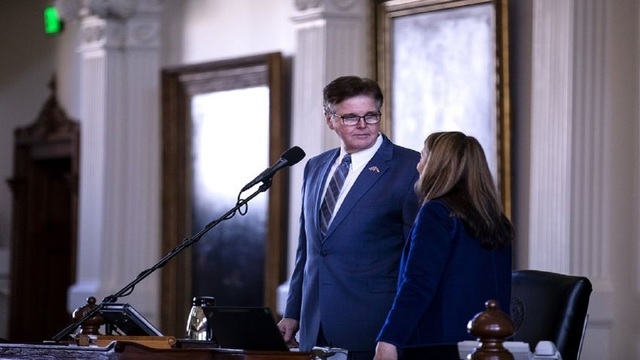 Dan Patrick said Friday that if no deal materializes over the weekend, he plans to take the “nuclear option” on Monday and force a vote — blowing past Senate tradition to bring up the bill with a simple majority instead of the three-fifths vote typically required in the upper chamber. For months, Patrick and his lieutenants have struggled to pass Senate Bill 2, a sweeping reform measure that would require cities, counties and school districts to seek voter approval for any tax levy increases of more than 2.5 percent in a given year, not including new growth. Needing 19 votes to bring the measure to the floor, and having, he said, 18 of 19 Republican votes in the upper chamber, Patrick had to watch the bill stall for more than two months after it was filed. Traditionally, the upper chamber starts the session by passing what’s called a “blocker bill” — a bill that sits ahead of any other priorities on the Senate’s ordered agenda so that bringing up anything other measure ahead of it requires a three-fifths vote, or 19 senators in support if all 31 are on the floor. Passing that bill would allow Patrick to bring a measure to the floor with a simple majority of senators, just 16. The “blocker bill” tradition dates back at least to the 1950s. It wouldn’t be the first time Patrick upended tradition to grease the skids in the chamber he’s led since 2015. That year, in his first term as lieutenant governor, Patrick lowered the threshold from two-thirds to three-fifths, allowing the chamber’s Republicans to bring legislation to the floor without support from any Democrats. Senate Bill 2, along with an identical House Bill 2, was filed in January after the governor, lieutenant governor and speaker of the House declared a united front in addressing property tax reform this session. But since then, facing opposition from local officials who argue the 2.5 percent election trigger is too low to accommodate their budgeting needs, it stalled in the Senate, passing the upper chamber’s property tax committee in February but not coming to the floor for a vote. Meanwhile, in the House, the once-identical bill was overhauled in committee to carve out school districts, a change that has drawn criticism from some of the lower chamber’s more conservative members. The House, which seems to have been moving the measure at a faster clip, was scheduled to debate the property tax bill on Thursday, but recessed that morning amid rumors that the Senate would instead bring up its version first. After a day of private negotiations, neither chamber brought up the proposal. On Thursday evening, Patrick had a conference call with a handful of Senate Democrats, according to several sources familiar with the call. In that call, he informed them that he intended to force a vote on Monday, as Texas Monthly first reported on Friday. Sen. Kel Seliger, the Amarillo Republican who Patrick says has been the only Republican holdout on the bill, panned the plan as a “desperate measure.” If Patrick does go ahead with the plan, he wouldn’t require support from Seliger. This article originally appeared in The Texas Tribune at https://www.texastribune.org/2019/04/12/dan-patrick-says-hell-use-nuclear-option-pass-property-tax-bill/.